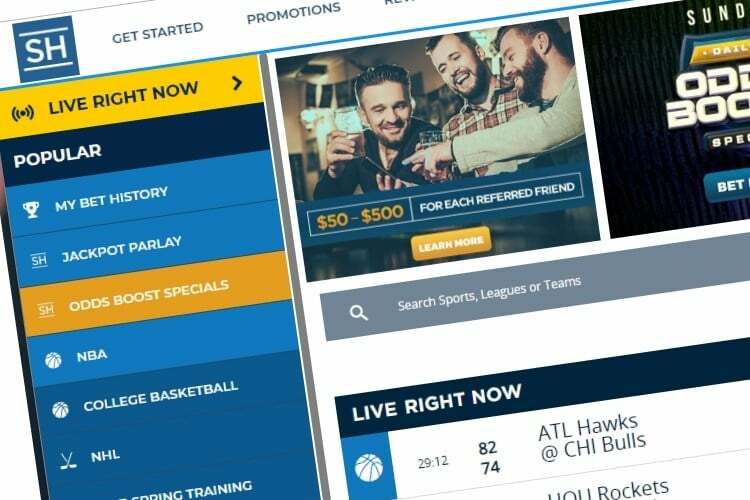 The sportsbook is a collaboration between between SugarHouse, Rush Street Interactive, Kambi Sports (an online sports betting and tech supplier) and the Golden Nugget Atlantic City. SugarHouse has already operated an online casino under Golden Nugget’s NJ license and integrates the casino with the sportsbook. SugarHouse is the total package according to our criteria and overall, Sports Handle rates the sportsbook an B-plus. Meaning — solid with room for improvement. You can follow them on Twitter at @PlaySugarHouse. The SugarHouse bonus offer is a 100% match up to $250 for first time depositors. Use code HANDLE when depositing. For starters, you must be located in New Jersey to use any version of the sportsbook. The state requires that SugarHouse (and other sportsbooks) use geo-tracking technology to make sure players are in the state. Note that Kambi also powers the DraftKings Sportsbook on the tech and pricing/odds side, so SugarHouse does have some similar components and features. That said, even sportsbooks sharing the same suppliers and vendors have been offering different prices and lines on the same games/props. Overall it’s smooth and easy to use. The “menu” button on the top left (as seen above – to the left of the SH logo and “7” on the mobile screen) is pretty much your home base. Use that to navigate around. Unique to the mobile app: Just below the “Menu” there’s “More Sports.” Depending how you bounce around, you may need to hit that button to pull up another league or sport you want to view. Once you tap the sport/league, hit the “X” or the portion of the screen on the right side to go forward and view the games/lines for that sport/league. On the top of the mobile window you’ll see a carousel with different banners and promotions, including a “Game of the Day” or casino promotions. These can be a bit intrusive or distracting at times; however in the web-platform it’s a non-issue. More on user experience in the section below. On the download time/buffering speed, there’s some light buffering when navigating different areas in the platform. It’s not perfect, but acceptable. Registering on mobile versus the web platform is about the same and requires the same information. All the same options as on mobile but better user experience. One benefit is that the menu of sports on the left side will remain static, and likewise for the betting on the right hand side. So you don’t have to toggle around — it’s all right there in sight. At times you’ll get the “loading” screen when you’re toggling between menus, but it’s brief. The pricing is competitive among legal New Jersey sportsbooks both spread, moneyline, totals and other bets. On football spreads, they’re almost all 20 cents, or typically -110 on both sides on spread bets. In many cases we observed moneyline pricing on football a bit higher than some competitors. For example on a Dolphins-Jets game in Week 2 of the 2018 NFL season, the Dolphins (+2.5) appear +118 on the moneyline and the Jets (-2.5) -143 at SugarHouse. At a competitor, the Dolphins (+3) are +125 and the Jets (-3) -145. Note that SugarHouse runs promotions with low juice on some primetime or select games. One innovative and pretty cool SugarHouse feature is the ability to “Cash Out.” What’s that? 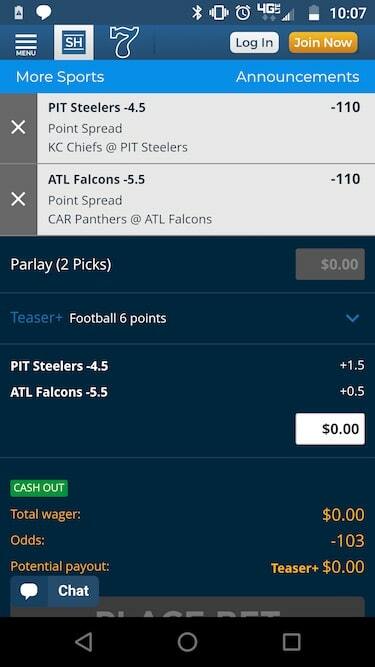 If you placed a wager and, well, no longer like that bet based on the game situation or just a gut feeling — you can “Cash Out” for an amount the sportsbook will offer. If the game (or season) is going favorably for you, you may have the option to cash out for a profit and walk away. If things aren’t going your way, you may accept an amount less than your wager. Kind of like taking insurance in blackjack if the dealer is showing an Ace. The “Cash Out” is an interesting twist and a nice option to have. For other betting options, SugarHouse generally offers the same options as others in the market — as far as straight bets, parlays, teasers, futures and props. For most NFL games, there’s a number of alternative lines available. You can’t “buy” a point or half-point for straight bet, but you can probably find your desired line on an alternative line menu. For teasers, when you select multiple wagers, the “Teaser+” option will show up toward the bottom. For football, you can choose between 6- 6.5 or 7-point teasers, priced correspondingly. One of our favorite features at SugarHouse is truly great pricing on teasers and parlays. Instead of traditional 2.6:1 on parlays for example, SugarHouse prices out a lot of alternative lines, and generates prices based on those lines. We’ve done a lot of testing and in probably 95 percent of cases, you can get a better teaser or parlay price on SugarHouse as compared with competitors that do not use Kambi pricing/risk-management. Overall it’s good and the navigation is intuitive. There’s a few odds and ends to learn and a short learning curve as with any online sportsbook. Betting slips: When you pick a wager, it will pop up in a menu at the bottom. You can easily “X” out wagers you want to dismiss, or hit the down arrow (at right) to pull the menu down to continue viewing the sportsbook and possible add another pick. When you get to the football menus (or basketball), use the dropdown “Money Line” to switch to Spread and Total Points. Ideally SugarHouse will consolidate the spread, moneyline and totals into one menu so it’s not necessary to toggle between the options. When you pull up your betting selections and hit “Place Bet,” your wager processes right there. You don’t have to re-enter a password or anything, which could be costly when dealing with live betting. 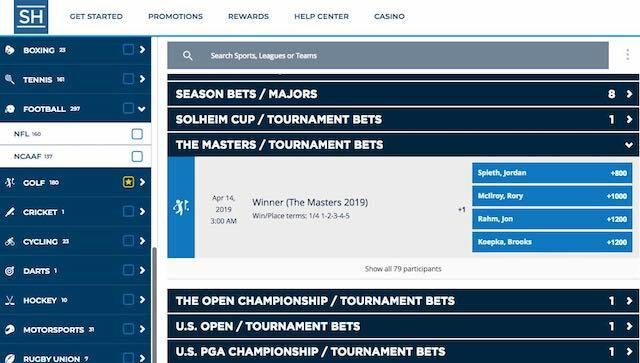 Speaking of live betting, the lines are constantly getting updated and they offer a ton of live betting options on seemingly every sport that’s available to bet. Not sure what’s happening live when you’re logged in? Hit “Live Right Now” and get directed to those events. At any time you can stop into “Sports Bet History” — check out “all,” “open” or “settled” bets to see how you’ve performed and what’s open. Hit the calendar button on the right upper side (this is on the desktop version only) to pull up a specific timeframe. On parlay and teaser wagering, it’s nice that the betting slip updates the odds in real time, so you can see what kind of payout you’re looking at when you add or subtract a team/total. It’s also very easy to remove a pick from your slip. 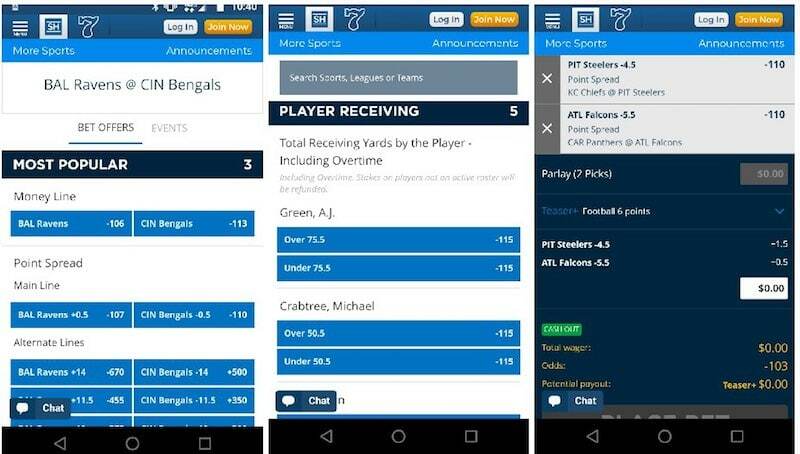 On mobile (or desktop) can easily “X” out wagers you want to dismiss, or hit the down arrow (at right) to pull the menu down to continue viewing the sportsbook and possible add another pick. On both the mobile app and web, there’s a “news feed” that sometimes appears, highlighting wins by other users. It’s distracting and unnecessary. 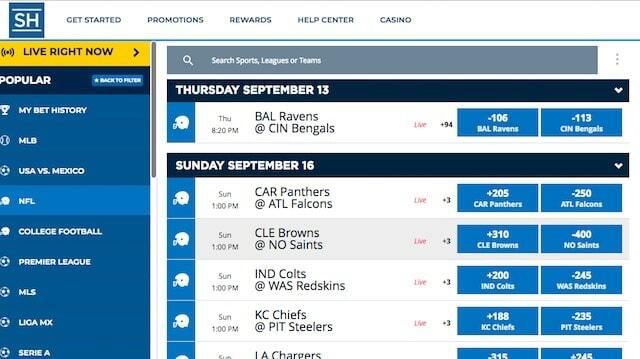 On both the mobile app and web, sportsbook also has a useful search feature, so you don’t have to go scrolling up and down to try and find Old Dominion @ Charlotte for example. You can search for a league, team or sport. At the bottom left of the screen on both, you’ll find a chat box where you can get real, live support from an agent if you’re having an issue. We’ve tested it and there appears to be real humans at the wheel who can look at screenshots to resolve an issue if you’re having one. Recently like other Kambi-powered books, such as DraftKings and 888sport, SugarHouse began offering a “cash out” feature, so you can lock in a win during the contest, or before the future bet is decided. 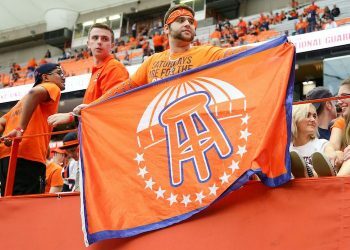 For EV+ bettors, it’s probably inadvisable, but there may be circumstances where you want to pull the trigger on an offer. SugarHouse also recently began offering “Odds Boosts” — for example, offering a promotionl increase on the potential payout for a prop bet, such as first player to score a touchdown in a certain football game. We saw a boost on Saquon Barkley from +550 to +800 for instance. We deposited using the ACH/eCheck method by connecting with a bank account. The deposit was processed in only a few minutes. Two weeks later with withdrew funds and it came through back to the bank account in about 48 hours. You’ll need to have your routing number and account number handy. Recently SugarHouse added PayPal as an option. PayPal is pretty easy to use, so consider that a top deposit/withdrawal option. SugarHouse is a licensed, regulated sportsbook so you can have confidence your funds are safe and secure. You can withdraw with PayPal if that’s what you used to deposit, likewise for ACH/eCheck, Neteller, also you can get cash at the Golden Nugget Atlantic City or SugarHouse Casino cage (in Philadelphia), or with a SugarHouse+ prepaid card account. Regarding funds, if you navigate to My Account → Statements → Summary, you can see your deposits, funds withdrawn, bets, wins and bonuses. You can filter this over a given time period to track your performance over a given stretch. overall is pretty good, and one we recommend for all the reasons above. There are some areas where it could improve, namely fixing the menus and U/I and removing some clutter. will be coming to Pennsylvania, soon.